We’ve made getting growth mindset right easy with our new blog. Growth mindset. We’ve all heard of it. We’ve read about it. Most of us have had training on it. We’ve probably even taught a lesson on it. But how many of us really feel like we have a true growth mindset classroom or school? Integrating it fully into our teaching is not just a simple case of understanding the theory. In this blog, we’ll explore the key principles drawn from Carol Dweck’s theory of fixed and growth mindset and suggesting practical ways to integrate it in your school. We’ll also consider common misconceptions within the approach, so you can get it right first time. For a quick overview of the 15 most effective growth mindset tips and strategies you can use the classroom today download our free guide to Getting Growth Mindset Right (tips, poster and list of recommended growth mindset resources included). Put simply, a growth mindset is when an individual believes they can develop their intelligence. Whereas a fixed mindset is when a person believes their intelligence and characteristics cannot be changed in any meaningful way. What does a fixed and growth mindset look like in the classroom? In maths, a fixed mindset might look like this: “I’m no good at maths. It’s not something I’ll ever be good at”. These pupils tend to avoid taking on challenges in favour of completing easier tasks to look clever. It’s safer to get something easy correct than stumble with a tricker question. We can all think of pupils we’ve taught who are like this. On the other hand, a pupil with a growth mindset knows that, through dedication and effort, these qualities can change and that they can develop their intelligence and abilities. They believe they can become better mathematicians. Like all things in teaching, through hard work, careful language and practice, it is possible to adjust the way pupils think so they’re not trapped by a fixed mindset. Through the language we use, activities we plan into our lessons, and by modelling it with our own behaviour we can encourage pupils to move towards a growth mindset. Of course, you might be asking what the long term benefits of this really are! Studies have shown that if you have a growth mindset, you’re more likely to continue working hard, even when you meet obstacles or failures. You persevere, adapt, and try different strategies and you learn. Instilling this mindset in the children we teach gives them the skills and outlook which will support their learning throughout education and into adult life. So with this in mind, we’ve created our top list of ways to develop a growth mindset in the primary classroom. These insights are taken from the successes – and mistakes! – we’ve made along the way as maths intervention experts. In short, we’ve made the mistakes, so you don’t have to! If you’re interested you can find out more about our 1-to-1 maths intervention by clicking here. Ours is a practice built around research demonstrating that, compared to other subjects, pupils are most likely to believe they won’t succeed at maths. This is why our maths specialist tutors work hard to embed a growth mindset in pupils from the very first “getting to know you” lesson. You can also find out more about the techniques we use to engage pupils, breed confidence and, ultimately, achieve results on our blog, 20 Maths Strategies KS2 That Guarantee Progress for All Pupils. An EEF study in May 2013 found that educating teachers about growth mindset in CPD sessions had “little impact” on students’ progress. However, they found when pupils were taught about growth mindset directly, they made an average of two additional months progress in English and maths. Teacher tip: If you organise growth mindset training, also provide a series of suggested lessons plans for your teachers to work through with their pupils. It’s often the case that growth mindset is introduced to pupils through PSHE, equivalent lessons or in assemblies. This isn’t a problem, but it should then be applied in all subject areas. Research in the US has shown that using university students to teach pupils about the malleability of intelligence led to large improvements in standardised tests. These workshops mostly included hands-on work in maths and literacy. This helped pupils understand how growth mindset applies in lessons. Teacher tip: Take time to plan as a school ways in which teachers can integrate growth mindset across the curriculum. Why not download our free guide to Getting Growth Mindset Right (includes tips, poster and list of recommended resources), or check out our blog post on 9 Ways to Embed Growth Mindset in the Primary Classroom. Dweck found that people’s idea of intelligence can be moulded by subtle environmental cues. This includes the words that we use to praise our pupils. 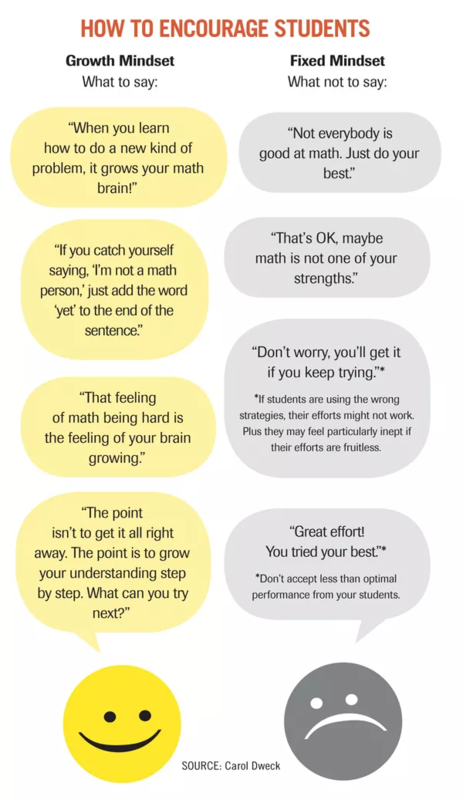 Some phrases reinforce a fixed mindset: “That’s correct, you’re so good at maths”. Others lead towards a growth outlook: “you worked really hard to find the answer”. Teacher tip: Share a list of key phrases to develop growth mindset with your staff. There are lots to be found online (see the image below for a great example), or you can download a list of free growth mindset phrases here. A great place to start is simply by using the word “yet” in your classroom to help transform attitudes. For example, “I can’t do this” becomes, “I can’t do this yet”; “I don’t understand” is suddenly, “I don’t understand yet”. This tells your pupils that there’s always room for them to learn and improve. One of Jo Boaler’s top tips to encourage a growth mindset in maths is to emphasise how the subject is about learning and not performing. This message can sometimes be confused when we focus on quick recall of number facts e.g. times tables. Teacher tip: This doesn’t mean we should move away from encouraging numerical fluency. Instead, we should try to make it clear that the process of practising number facts is simply to help solve problems more confidently. Remember, how quickly they can do this isn’t always the be all and end all! Maths lessons can sometimes appear to place more value on speed and correct answers than careful and considered reasoning. To build numerical fluency, we might focus on recall of number bonds and times tables or procedural fluency with written calculations. When there’s only one right answer to a question, it can be really hard for struggling pupils to believe they can change their abilities. Teacher tip: To avoid this, integrate as much reasoning and problem solving into your lessons as possible (more on this in our blog, Developing Reasoning: How to Improve Maths Reasoning Skills in Primary Pupils). This gives pupils the chance to work towards solving a problem, even if they don’t initially get the answer right. Additionally, try to use open questions where possible, giving pupils the chance to explain their answers in a way which makes sense for them. This has the added benefit of helping pupils see there are different ways to find answers. Individuals with a growth mindset tend to like feedback because they can use it to improve. However, fixed mindset pupils may see feedback as purely negative if they associate it with something they’ve answered incorrectly. Teacher tip: Try giving pupils a few moments each week to think about the feedback they have been given and how it has helped them improve. Then ask one or two to explain their example to the rest of the class. For pupils with a fixed mindset, this modelling will encourage them to see that feedback can be an informative and useful tool. 7. Embrace challenge and teach children to love them! For pupils with a fixed mindset, challenge is scary. Why risk failing and being embarrassed by stumbling on a hard question? With this in mind, it’s important that harder tasks (or challenges and extension activities) are framed in a positive light. Pupils should be aware that it’s not just about getting it correct, but giving it a go. Teacher tip: Always speak about challenging tasks with enthusiasm and excitement. Make it clear that if anyone would like to have a go they can. Take note of the language you use to set the activity. Rather than saying “this task is really difficult”, you could say “there are lots of chances for you to try out different strategies with this question and do lots of learning”. Some schools find that giving pupils the freedom to choose the level of challenge in their work has a positive impact. One of the most powerful messages we can take from the growth mindset theory is that mistakes should be seen as an opportunity. Pupils should be encouraged to identify where they went wrong, learn from it and improve for next time. Teacher tip: A great way to show mistakes are okay is to create a “mistake friendly” classroom. This lets pupils know it’s absolutely okay to get stuck and then improve. Spend some time looking at famous scientists or mathematicians and the way in which they have failed. As Jo Boaler suggests, when pupils get something wrong, you could say “you’re brain just grew, synapses are firing! That’s really good!”. Consider integrating a few minutes for reviewing mistakes into all your lessons. You can then reward and praise children who spot a mistake, explain what they got wrong and correct their work. You could even invite them to present it to the rest of the class. Pupils with a fixed mindset often think that other pupils don’t have to try, they just know the answer. It’s important therefore to emphasise the hard work all pupils are putting in. So always ensure to make the effort visible. Teacher tip: To build resilience, reward pupils for trying hard and for persevering when they are struggling. Praising effort rather than pupils getting things right all the time decreases the pressure on pupils who feel like they can only volunteer an answer if they’re sure it’s right. 10. But…don’t just tell pupils to try hard! Carol Dweck has written more recently about the risk of putting too much emphasis on the effort with the result that you ignore key things which contribute to a growth mindset. It’s important that this praise of effort is not divorced from learning or progress. Simply saying “great effort” when a pupil tries but gets things wrong is actually praising ineffective effort. Clearly, this is not fair if you don’t then work with the pupil to develop strategies to improve. Teacher tip: If a pupil is getting things wrong despite trying hard, you can praise the effort but make sure this is always followed up with next steps. Either look over the work and evaluate mistakes or help the pupil to try a different strategy. You can read me on Recognising and Overcoming False Growth Mindset here. Changes to mindset can’t happen in isolation. Pupils cannot practice a growth mindset if; they are given inappropriate activities, they are not being given feedback they can act on, they are not provided with future learning strategies. Teacher tip: Take care to plan lessons with growth mindset in mind and make sure you always consider these three key growth mindset questions in your planning process. Does the work provide the opportunity for pupils to learn something new? How will I give my pupils meaningful feedback? What strategies can I model for struggling pupils? Growth mindset is great, but it’s not a magic wand. People’s mindsets are shaped by their environment and the people around them. Dweck has spoken a lot about changing learning tasks, testing practices and marking systems to reflect this. It can be challenging in the current educational context, but it’s really important that pupils know school is about learning and not testing. Teacher tip: One thing you could review is your approach to assessment. While there are summative testing commitments we can’t get away from (e.g. SATs), regular summative assessments which simply give pupils’ a level or score don’t really support a growth mindset. Is there space for you to move to more formative assessments? Or, can you do more analysis of your existing assessment results on a pupil level so that the main takeaway is their next steps rather than their current level or score. As we’ve already mentioned, environment shapes growth mindset. It’s therefore essential that if we want to make any real changes to pupil mindset we involve and educate parents about this. We all know those parents who sit in parents evening and say, “well, I was rubbish at maths when I was at school”, or “I can’t help them because I don’t know how to do it”. Teacher tip: Invite parents into school to find out about growth mindset and explain how they can help at home. If they can’t come in, put together a list of top tips for parents and send them home. Another idea might be to set some homework specifically around growth mindset that pupils and their parents need to work on together. You could even hold a growth mindset assembly or give awards to pupils each week which focuses on growth mindset. For more on getting parents engaged with their pupils’ maths learning, download our free guide: ‘Maths at Home – 15 Top Tips for Parents and Carers’. Within training, lesson observations and coaching staff also need to be open to change and growth. Just as summative assessment reinforces a fixed mindset for pupils, grading a lesson can suggest to teachers that they’re teaching is fixed at a certain level. Clearly, if we are telling pupils that it’s OK to make a mistake, we have to take the same approach with teachers. If teachers are worried about getting things wrong or under huge amounts of pressure, they’re unlikely to want to try any new strategies or make changes to their teaching. It has to be acceptable for teachers to experiment, and it’s important for SLT to support and cultivate this approach. Teacher tip: Rather than give a grade, pick out one or two actions which teachers apply to improve their lessons. Or rather than judging whole lessons, set a focus for each week or half term and work with teachers to come up with ways to improve this across the school. In addition, providing a supportive and effective programme of CPD will go a long way to reinforce growth mindset and creates a culture of lifelong learning in school. Another thing you can do is to shift the focus in any staff briefings or regular meetings that you have. These have a tendency to be based on upcoming events in the calendar. But really, this information can be shared easily by email or a staff portal. Instead, use the time to focus on CPD. How about picking a teaching tip that can be explained and quickly practised by all teachers then integrated into teaching that week? These steps are useful, but underpinning it all, is the fact that to make your pupils truly embrace and present a positive attitude focused on growth mindset. You will need to look at how your whole school structure, culture and processes feed into a growth mindset approach. Otherwise, there’s a risk that our own actions may reflect a fixed mindset and pupils will pick up on this. Download and share with staff our free growth mindset top tips and classroom or staffroom poster. Deliver staff training on growth mindset. Give teachers time to plan growth mindset lessons – you might want to design a lesson plan around the suggested reading in our free growth mindset resource. We hope you find out insights into growth mindset helpful, and we’d love to see how you use them in the classroom. Tweet us @thirdspacetweet and let us know – what do you think good growth mindset culture looks like in the classroom?